Donnie Tyndall, assistant coach Beau Braden, Josh Richardson, Armani Moore and Kevin Punter spoke with the media Thursday afternoon. Here are a few notes from Tennessee’s media availability. The Vols face Kansas State, No. 23 Butler and NC State in their next three games. Too Many Fouls: The Vols rank last in the nation in fouls at 26.2 per game and that’s something Tyndall is addressing with his team. They started calling fouls in practice this week – something that is uncharted waters for Tyndall’s team. 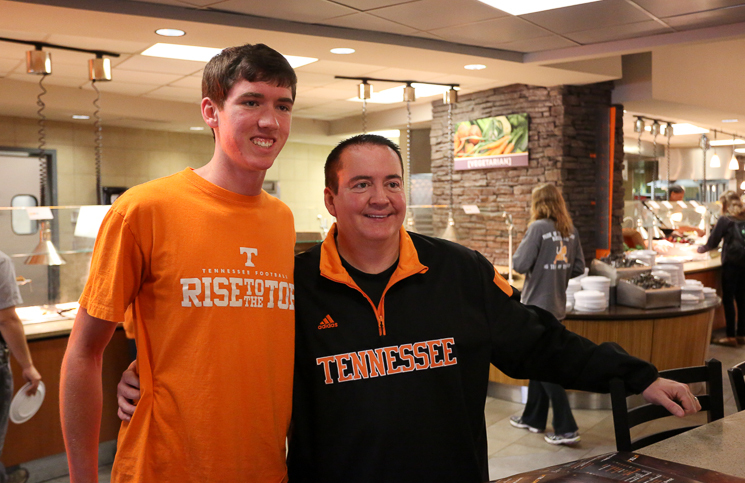 Tyndall Meets with Students: For more than an hour, Tyndall hung out with Tennessee students (picture above) at PCB Cafe on campus Thursday afternoon. He signed countless autographs, encouraged fans to come to Tennessee’s game with K-State on Saturday and posed for numerous photos. Tyndall has participated in hundreds of similar events since taking the Tennessee job and has made embracing the community a clear priority. Bonds Update: Tennessee still hasn’t heard from Liberty about Braxton Bonds. Tyndall had hoped they’d sign a waiver supporting his immediate eligibility, like Memphis did with Dominic Woodson, but Liberty has been reticent to do so despite Bonds’ extremely limited time on campus. Things certainly aren’t looking up on that front. Kansas State is shooting 40% from beyond the arc this season but allowing opponents to shoot 39% from deep. The Vols have struggled to defend the three-point line this season and have been an inconsistent team from three-point range. Whoever wins that battle will be in position to win Saturday’s game. Vols Bring the House for Darrin Kirkland Jr.